I have been thinking for two weeks about this blog entry, I just wanted to write about my weekend at Yarndale and few Yorkshire tales too but it occurs to me that I might have to write something else. I am going to write how surreal these past two weeks have been and how touched I am for all your comments and the amazing popularity the blanket has reached. I totally wasn’t expecting such a success and it fills me with happiness, do you know why? It is because when I started my blog I started because I wanted to share something that I thought even if it is just some yarn worked with a hook it has some amazing power to bring people together and to bring a little slice of rainbow and warmth. It might sound a bit pompous but I knew the Eastern Jewels was a good blanket, sometimes when you crochet so much you have good blankets and maybe not so good blankets- it is all a part of the process. BUT when I was making the eastern I thought “WOW this one looks good! !” as I never plan ahead or sketch the different squares it really becomes alive as it grows. BUT when I was making the Eastern I thought “WOW this one looks good! !” as I never plan ahead or sketch the different squares it really becomes alive as it grows. But I never thought in my wildest dream that it would have been so good! What I thought about as I was making it, and please correct me if you think is not the case, is that crochet is really universal and never mind who you are, where you live or how old you are, you can see the same thing I see and that to me is mind-boggling. And so exciting. So when I read all those amazing comments under the Stylecraft competition I was like ohhh my goodness- all that work, all that frogging and endless cups of tea and pieces of octagons on the floor everywhere do have paid off! I manage to let you see what I see or better what I want to see. Can we crochet something as ephemeral as happiness? Probably we can, or better according to your comments we absolutely can! You can sit in your home or whenever you like and with some balls of yarn you can make something that makes you smile and it is not an attempt or a copy! And it is not like a painting that you need a magic touch…you just have to follow some lines written in a piece of paper and there you go! You have the exact same blanket done by you for you. And I find that so amazing! I wish I could find the words to better express what it has been like seeing all these messages, and following all the saga of Stylecraft running out of yarn, running out of brochures because no one could have predicted how popular the blanket would be! It has been so crazy that I started to make another one myself! I started before I left for Italy at the beginning of the week and I took some of the octagons with me to let my parents see them and it is so interesting remaking the same blanket again and so enjoyable because this time I have not to think or frog constantly I just follow the patterns and it happens again all those colours start to sing together! Yes, you can repeat over and over. Now I am thinking about all of you crocheting the blanket in your homes, maybe you have a special place where to put it once it has been done or maybe you have a special person in mind to gift it to. I find it so humbling that you decided to take a little bit of my thoughts and bring it to something as special as your own home! But also want to point on something else which is collaborative work. How great we are when we join together and work together! I would probably never manage to make something as the Eastern Jewels is if Jane had not let me use her pattern! I am so happy about this post, Lucia. 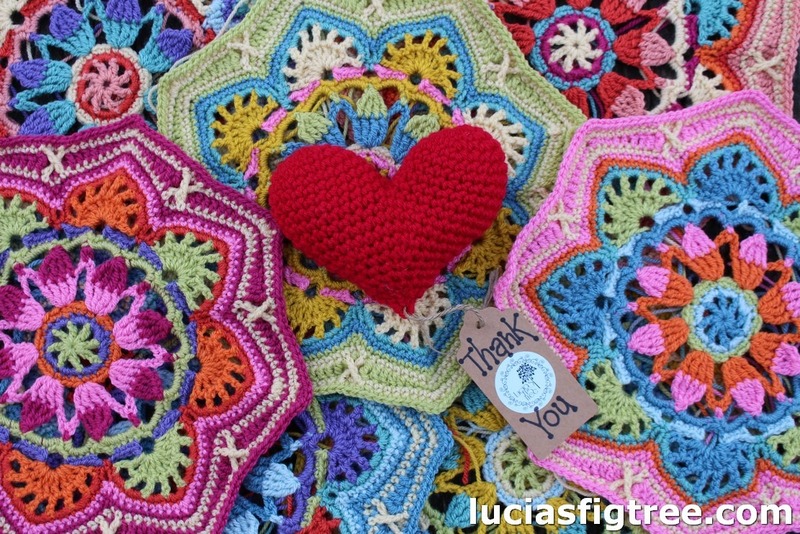 It shows beautifully what a kind person you are and how you appreciate and acknowledge everybody’s contribution to our all-embracing crochet cosmos. And I am so grateful for your work & voice in it. Lovely post. I’m not surprised how popular it’s been, I’m loving making mine. Jane’s instructions are so good to follow and it’s a surprise as I’m crocheting to see what colours you put together. The combinations are definitely not what I’d have chosen but it’s looking good already. It must be so good for you seeing so many Eastern Jewels in production! It is a truely stunning interepretation of a gorgeous blanket lovely and many congratulations on its fabulous success!! This is so lovely, Lucia. And yes, you created an absolute jewel that many will cherish for many many years yet to come. It radiates such a cheerful harmony of colours that lifts up the soul just by looking at it. Well done!! I just wanted to say how much I enjoy reading your blog! I’m also knitting your new colour way for Persian Tiles and what a delight it is. You have a wonderful way with colour and your skill and enthusiasm shines through. Such beautiful and inspiring works! Love your creations. I love the blanket, but I am curious why one of the colours is in life dk. I know it can easiliy be substituted by special dk. But I was wondering why you choose to use it in the first place. Was it a deliberate design choice? I am going to order the pack and am really looking forward to it! Lucia, I have just purchased a kit for your colour way of the Persian Tiles blanket from Black Sheep Wools. I am excited to get started. Unfortunately here in Brisbane , Queensland, Australia it is quite warm and humid but thank goodness I have air-conditioning in my sewing room. Thank you for creating this lovely colour combination.